Home Games News Controversy Continues: Far Cry’s 5 Trailer “Baptism” Is Out! 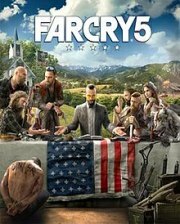 Upcoming and possible bestselling Montana’s game Far Cry 5 rocks gaming world with excellent pumped up trailer called ‘Baptism’. This game is one of the most anticipated games of this year. The game is set in the fictional Hope County, Montana, where a preacher named Joseph Seed has risen to prominence. Seed believes that he has been chosen to protect the people of Hope County from an ‘inevitable collapse’ and has established a congregation called Eden’s Gate. In reality, Seed is a radical preacher and Eden’s Gate is a militaristic doomsday cult. Under his rule, Eden’s Gate has used both coercion and violence to forcibly convert the residents of Hope County, and intimidation to keep them from contacting the outside world for help. When an attempt to arrest Seed ends with the deaths of several lawmen, the player is swept into the armed conflict between Eden’s Gate and the remaining Hope County residents, who are organizing themselves into a resistance movement. This is the premise of FC5 and trailer is connected with Joseph Seed before he was doing his job as The Father – story which was already well known in the fandom. Controversy postponed the game from it’s announced date (May 2017) because of a possible connection with Brexit, Donald Trump election, and so-called ‘far-right rise’ in the European Union.